Have you ever thought or argued with your colleagues about what is the best sales channel today? Undoubtedly, there are fans of the traditional brick-and-mortar stores, advocates of online shops, believers in selling at Amazon, Ebay or the like. It’s hard to come to a decision on that matter, as it is quite subjective and there are no criteria to define the truly “best” sales channel. However, it is not needed if you want your business to grow. The ultimate answer to this question is that it’s best to extend your presence to each applicable sales channel instead of choosing the most lucrative one. In fact, among the freshest ecommerce trends for 2016, multichannel selling is one of the top ones. While some time before it traditionally meant running an online store based on the existing retail shop, now things have changed. Today, a brick-and-mortar store isn’t an obligatory part of the scheme. The whole idea behind multichannel sales is extending your presence to the online places where your potential customers are looking for items they need. It seems quite logical, as the chances of acquiring new prospects through multiple marketplaces are several times higher than when you’re putting all your efforts into a single online store. So, if being outgrown by competitors isn’t in your plans for the year that’s just started, following the latest sales trends is vital. Multichannel sales is one of the most important ones, remember? So, where do you start? What marketplace has already become synonymical to the word “shopping”? Yes, you’re right, it’s Amazon. With its 85 million of unique visitors, it is definitely not to be missed out. Shoppers love it for the great chance to find nearly every item imaginable, fill their cart with products from different merchants and conveniently checkout with just one payment instead of making several separate ones. Mind that selling on Amazon isn’t free, so you’ll be charged depending on the category of your products. Moreover, unlike having your own store, your freedom of expressing yourself and showing off your brand will be limited, as well as the opportunity to catch your customers’ personal details. Nevertheless, this shouldn’t be the reason to neglect excellent service for each buyer. If you’re ready to step to the international market, Ebay might be your chance. It is extensively used for selling in the USA, but compared to Amazon, features more customers from all over the world. You will have to pay to be listed here, but it is definitely worth it. This is a relatively new marketplace, which is extensively marketed, so it is quite beneficial if you wouldn’t like to invest into advertising. Moreover, the attractive offers and savings provided by the Jet.com are sure to drive lots of traffic to this website. If your business is centered around exclusive items, this is the right place to list them. Taken than Etsy attracts customers who are ready to pay a lot for items not intended for the mass market, it is quite promising in terms of revenue and sales. There are lots of marketplaces that don’t limit engaging their social networks audience by getting likes and shares on their brand profile/page. Some of them, like Ownza, are inspired by Pinterest, and offer new experience both for shoppers and merchants. Others, for example OpenSky, offers Facebook style storefronts for sellers and newsfeeds for shoppers. Fancy is a kind of social network when it comes to shopping (mostly fashion and beauty products), with it’s exclusive Fancy button, which lets tagging the products a shopper likes. 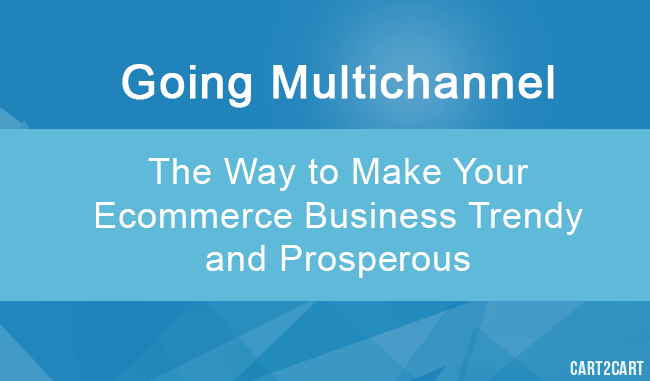 Multichannel sales look extremely promising for your sales, and entirely indispensable to keep afloat and develop your business in the highly competitive ecommerce environment. However, along with the numerous benefits come the obligations and efforts needed to get things going smooth. It is important that each marketplace provides true information about the items availability. It is simple to do in case with just one channel, but as their number grows, you’re likely to need inventory integration software to update products count in real time as soon as an order is placed to avoid confusion when an item has been sold, but it still shows as available due to system flaws. Keeping track of the revenue and expenses, as well as managing taxes for different locations manually can prove to be quite strenuous with multiple sales channels, so you might want hiring extra help or integrating accounting software to do it automatically. You are going to spend money for getting listed on multiple websites before you are able to sell and earn anything. Moreover, some marketplaces oblige you to accept not very beneficial conditions, like 180 day return period on Ebay, which can result in certain financial losses. Multichannel sales is a perfect means of exposing your business to more customers and placing items directly in their path, everywhere they might be looking for them. It lets you rely on these particular websites to do the marketing and advertising to drive traffic to your store. However, this also means more time, financial and efforts investments on your side. Nevertheless, with the right software and organization, it opens up new exciting horizons for your business that you undoubtedly wouldn’t like to miss.